American Legal Publishing currently hosts online more than 800 codes, meeting minutes and other documents for municipalities, counties and other organizations. Take a look at our Code Library to see how our online hosting services work. We can place your code and other documents on the Internet so citizens, law firms, contractors and other interested parties can locate the information they need quickly and easily. Mobile View available for mobile devices. If you don’t see a feature you want, just ask! American Legal Publishing Website Demonstration on Vimeo. American Legal can provide electronic versions of your code on CD and on the web. 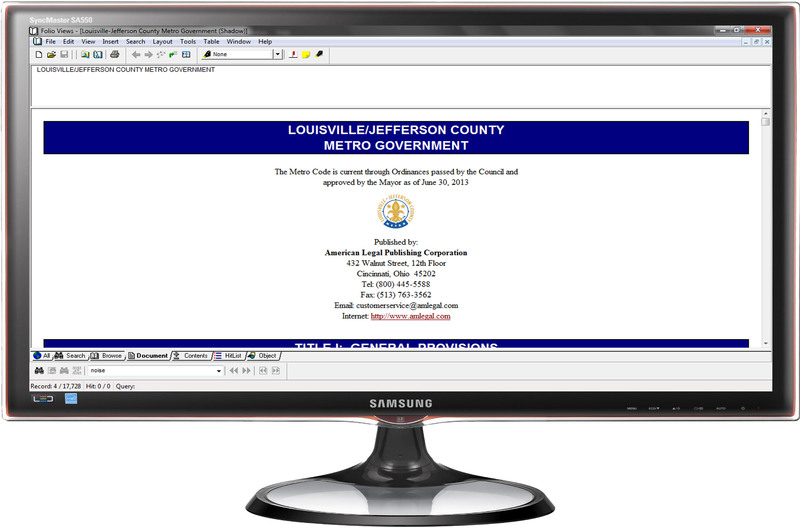 We use the award winning Folio VIEWS program to make your code completely accessible and searchable. We can also provide the code in MS Word, WordPerfect and PDF. It makes your information manageable. Folio gives users complete control over information. It keeps users in touch with the overall structure of the information they access. It makes large volumes of information manageable and helps users find answers fast – regardless of how large the document is. It makes information more valuable. Folio lets users do more than just browse – they can personalize the information, using electronic highlighters, bookmarks and notes to make the information even more valuable. It allows for easy, focused searching. With Folio, you can search your entire code or focus your search on individual chapters or titles. You can even search within your highlighters and marginal notes. With this control, users find the right answers quickly, instead of wandering through mountains of search results.